The forest is full of really interesting little creatures, and most of them are nocturnal. Most people realise that the kiwi is a 'late bird' but did you know that there are many species of insects and even snails that prefer the dark? 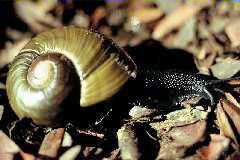 The kauri snail is one of them. This beautiful snail with its large glossy chocolate brown shell can be seen prowling around the forest floor looking for tasty bits to devour. As you walk through the forest at night, your ears hear a strange rasping sound, that's the song of the mighty weta. The two types found in Northland forests are the tree weta and the cave weta. The tree weta produces this distinctive sound by rubbing the hind femurs against the abdomen as both parts have short, stout spines and raised plates. A morepork (ruru) is often to be heard putting in his order for dinner. If you're lucky you might hear the distinctive call of the kiwi. The male generally makes a series of loud high-pitched calls, repeated at least 15 times. The female utters a guttural sound, which ends in a high note. These remarkable birds are still found in small numbers in Northland, something we can't take for granted when we consider other places in New Zealand where the forest is now bereft of this member of the night chorus. The forest is also home to some wonderful little bats (pekapeka). New Zealand has two sorts, the more common long tail bats and the rare short tail bats. The short tail bat is one of the few bats in the world which forages the forest floor for food, using its folded wings as 'front limbs' for scrambling around. The long tail bats, although weighing in at only 8-11 grams can fly at the astonishing speed of 60 kilometres per hour and has a home range of up to 100square kilometres! Even the streams come to life as our native fresh water fish come out of hiding. There are about 35 freshwater fish in our waters; nearly all of them are solitary, nocturnal and highly secretive. A common find in a forest pool is the banded kokopu, this little guy is a deep brownish-olive with narrow, pale vertical bands. As you walk through the forest, look under damp overhangs and along stream banks and you may see the night lights, the little glowworm, with its fishing lines out hoping to catch a tasty insect for tea. The glowworm carefully constructs up to 70 lines of suspended silk threads and decorates them with droplets of mucus to form sticky beads. The unsuspecting prey is then lured in by the light, and, as it rises upwards, is caught in the drops, and dinner is ready. For further information, contact Mita Harris or Carolyn Smith at the Bay of Islands Area Office 09 407 8474.